Genuine Trion activated carbon impregnated foam filter for 16 x 25" models HE1400, Trim-Tx, MAX51400, SE1400, IAQ1400, AirBear. Two filters are required for these models. 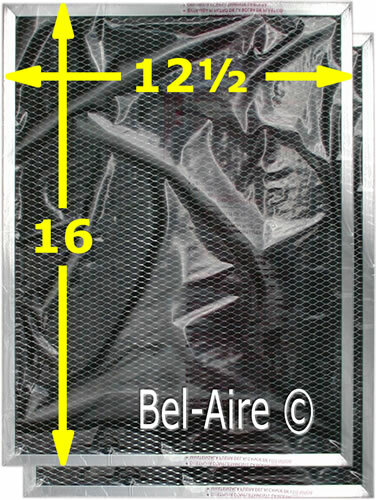 Our above price is for a package of 2 filters. 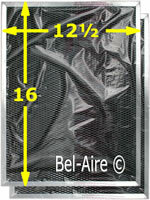 Each carbon filter measures 12 x 16 x 3/8. The activated carbon absorbs odors and fumes, replace once or twice a a year. This carbon postfilter will show premature dust if there are problems with your air cleaner; or provide proof that the air leaving the cells is dust free. Permatron manufacturers the prefilters for the brand name electronic air cleaners. Permatron also manufactures a premium line of electrostatic prefilters and activated carbon filters. Permatron has engineered filter upgrades for the F50A & F50E utilizing the latest advancements in filtration technology. Removes the larger particles to increase the cell efficiency. Removes odors from the air, does not mask them.